With our success in mapping the human genome, the possibility of altering our genetic futures has given rise to difficult ethical questions. Although opponents of genetic manipulation frequently raise the specter of eugenics, our contemporary debates about bioethics often take place in a historical vacuum. In fact, American religious leaders raised similarly challenging ethical questions in the first half of the twentieth century. 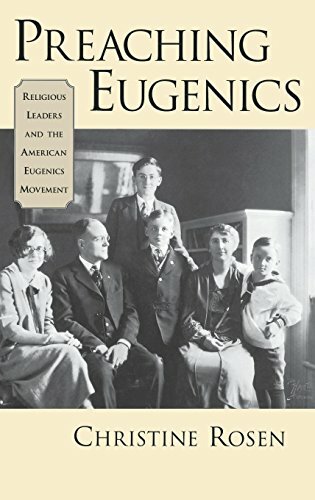 Preaching Eugenics tells how Protestant, Catholic, and Jewish leaders confronted and, in many cases, enthusiastically embraced eugenics-a movement that embodied progressive attitudes about modern science at the time. Christine Rosen argues that religious leaders pursued eugenics precisely when they moved away from traditional religious tenets. The liberals and modernists-those who challenged their churches to embrace modernity-became the eugenics movement's most enthusiastic supporters. Their participation played an important part in the success of the American eugenics movement. In the early twentieth century, leaders of churches and synagogues were forced to defend their faiths on many fronts. They faced new challenges from scientists and intellectuals; they struggled to adapt to the dramatic social changes wrought by immigration and urbanization; and they were often internally divided by doctrinal controversies among modernists, liberals, and fundamentalists. Rosen draws on previously unexplored archival material from the records of the American Eugenics Society, religious and scientific books and periodicals of the day, and the personal papers of religious leaders such as Rev. John Haynes Holmes, Rev. Harry Emerson Fosdick, Rev. John M. Cooper, Rev. John A. Ryan, and biologists Charles Davenport and Ellsworth Huntington, to produce an intellectual history of these figures that is both lively and illuminating. The story of how religious leaders confronted one of the era's newest "sciences," eugenics, sheds important new light on a time much like our own, when religion and science are engaged in critical and sometimes bitter dialogue. If you have any questions about this product by Christine Rosen, contact us by completing and submitting the form below. If you are looking for a specif part number, please include it with your message.